Across the chapters, the spotlight is on how the presence of a communication device impacts on interactions, and how different groups adapt their language and interaction style to accommodate aided communication. 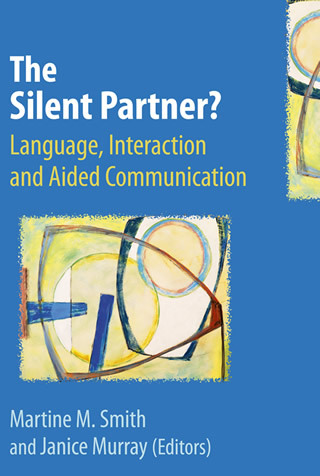 Rather than viewing communication aids as simply a poor substitute for speech, this book examines communication aid use as a unique, independent mode of communication that has the potential to shed light on the power of human communication and language learning. ...This book is written for an audience familiar with augmentative and alternative communication (AAC). The editors have collated a selection of chapters that use research to explore use of communication aids from a variety of perspectives (e.g. children developing expressive language via communication aids, and adults with acquired neurological disabilities). There is a focus on the impact of a communication device on interactions and how this affects language and interaction style. The importance of both participants' skills (e.g. attention, memory, symbolic representation and language) and joint responsibility in construction a shared meaning is highlighted. This is illustrated with case studies. Issues of identity and communication roles of the user and partner are explored. This book can be dipped into to explore a particular topic or read as a whole. I found much of the book engaging and thought-provoking but, at times, the specialist nature and rather academic style were challenging. However, it was interesting and relevant, and will keep a place on my bookshelf for future reference.